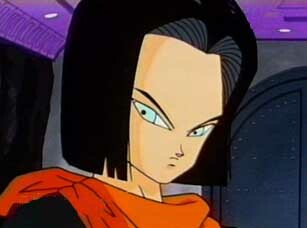 Android 17 and hid sister were gang members until Dr.Gero tricked them into becoming a human with a few extras. 17 is more voilent than his sister. However he does have a soft spot for his sister. He doesn't mind letting 18 try on clothes while they were searching for Goku. He was the first to be absorbed by Cell. 17 dies along with Cell but is wished back by Krillen. He later appears in GT, where he kills Krillen and fuses with hell's 17 to become the perfect villen, SUPER 17. He chose not to kill his sister when he had the chance and that lead to his death.